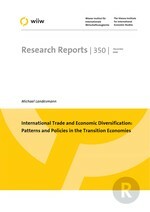 This report counter-poses the patterns of trade specialization and trade diversification of two groups of economies: the new member states of the European Union, NMS, and the follower countries of the Soviet Union, the NIS (Newly Independent States). It is shown that the NIS export structures are characterized by an exceptionally high degree of concentration and a very strong specialization in trade with the EU (towards fuel, metals, and - for a sub-group of NIS economies - labour-intensive commodities). The NMS economies show a much more diversified export structure, there is more evidence for upgrading. There is, furthermore, a discussion of differences of trade structures with respect to EU markets, intra-NIS trade and trade with the Rest of the World. We discuss reasons for the differences in the degree of export concentration and patterns of trade specialization between the two groups of economies, particularly the link to institutional and reform processes, as well as potential policy options for NIS economies.